Here in the Seattle area, you may have heard that the real estate market is fast with prices escalating to unheard of heights. Buyers have made offers with some creative details to win the house, and those still looking have become tired since the same house they didn’t win last year is now priced $50k-$100k more. Sellers have loved this market enjoying multiple offers and prices they never would have paid themselves. Review dates and multiple offers have become par for the listing process. Well, guess what? Within the last 6 weeks, A LOT more inventory has popped up. What does that mean? More choices for Buyers and, therefore, less frenzy for the one house on the market because now there are three within blocks of each other. I am stoked for my Buyers who have been searching for months. They are finally breathing a small breath of fresh air that maybe they won’t have to offer up their first born to gain the home of their dreams. So, Buyers, it is time to find your new home! Interest rates have risen, so the sooner the better. And now you have more choice. Yippee! I am ready to celebrate with you when we make an offer less than list price for a change. Are you ready to increase your wealth? I know I am. 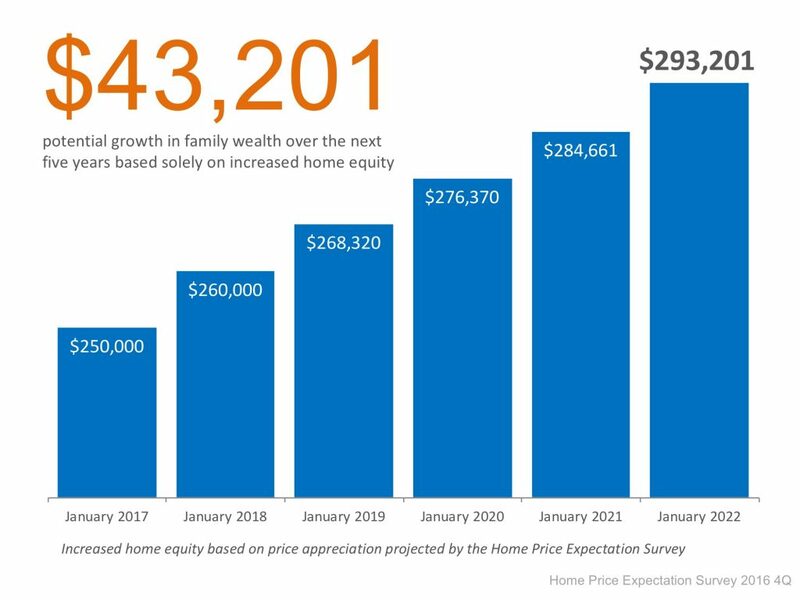 Over the next five years, home prices are expected to appreciate 3.24% per year on average and to grow by 21.4% cumulatively, according to Pulsenomics’ most recent Home Price Expectation Survey. Since the experts predict that home prices will increase by 4.0% this year alone, the young homeowners will have gained over $10,000 in equity in just one year. Holy COW! Over a five-year period, their equity will increase by over $43,000! Holy FREAKING COW! This figure does not even take into account their monthly principal mortgage payments. In many cases, home equity is one of the largest portions of a family’s overall net worth. If you already own a home, you have started on a great path to future wealth, so think about an investment property to help increase stability in your financial future. This is what my husband and I are going to do this year, finally, how can we not? I know it means we may not get to remodel the house this year, but it is the financially smart thing to do. Being financially smart may not fulfill my instant gratification needs, but in five years I will be very happy! Not only is homeownership something to be proud of, but it also offers you and your family the ability to build equity you can borrow against in the future. Buyers, please use a Real Estate Broker! “Why aren’t you using a real estate broker to help you make your offer?” I asked the man on the phone. I often hear of Sellers wanting to do a For Sale By Owner (FSBO), but rarely hear of a Buyer doing it on their own. “Because I want to use the Buyer Broker’s commission to make my offer stronger.” Ah, I see. “Did you know that the Listing Broker (in this case me) decides how the commission is disbursed to the Buyer’s Broker?” That gave him pause. I could be greedy and take all of the commission the Seller is willing to pay me if there isn’t a Buyer’s Broker, but I wouldn’t. I am worried about this Buyer. The market is full of multiple offer situations. How is he going to know how to make his offer the strongest? 1. Does he know that the Sellers want to close earlier and rent back until the 18th? 2. Does he know what an escalation clause is? 3. Does he know that offering too high can keep the home from appraising at the value the bank is willing to give a loan? 4. Does he know that there are ways the Buyer can address a low appraisal and still keep his offer strong? 5. Does he know that he should probably waive certain contingencies to be competitive? 6. Does he know what a pre-inspection is and if the Seller has done one or how to get one done himself? 7. Does he know how to negotiate inspection items if he does an inspection? 8. Does he know what a review date is? 9. Does he know that the lender he chooses makes a difference? 10. Does he know what Earnest Money is? 11. Does he know how much Earnest Money to offer? 12. Does he know the number of days stated on the contract are counted in different ways depending if it is more than 5? 13. Does he know what would cause a default of the contract? 14. Does he know when to present the offer? 15. Does he know real estate agency law? These are just some of the things that would be good to know when making an offer. In the market we are in (a strong Seller’s market), people who have amazing brokers don’t all win the house they want because there are too many Buyers and not enough homes at the same time. Wouldn’t you want to know everything possible to give the best offer possible and live in the house of your dreams? Go find a real estate broker who will work their pants off to get you that home! Well, maybe they should probably keep the pants on…that would be awkward. Sellers, it continues to be an amazing year for you folks. Buyers are begging to see your houses and can't wait to pay top dollar with the least amount of contingencies in their offers. You are also doing a great job getting your houses ready. You are making the choice for Buyers to offer easy when you change out the old carpets and put on a fresh coat of paint. The clean landscaping and the staging you are allowing me to put in your homes is giving the Buyers to get a warm, cozy feeling. The pre-inspection and fixes you did based on that inspection helps the Buyer feel better about offering without and inspection. And for those of you Sellers not willing to do some work or put money in to get the home ready, yet pricing it at top dollar, don't be surprised when it doesn't sell in three days like your neighbor's did. Buyers are starting to understand what market value is these days, and yours is below market value! After losing out on a couple of homes, Buyers learn what they need to do to get the house they want. Here's the thing, Buyers, the Eastside Seattle Market is VERY competitive. At first you want a screaming deal, but nothing you like is in the price range you have set. Next you want a good deal, but everything you see is overpriced or needs $100K in upgrades to make it livable. Finally, you will realize you should have paid full price for that house you thought was overpriced a few weeks ago because a similar house nearby is now $10K more expensive with a smaller yard. I have a client who bought a condo in September for $350K. A similar condo is on the market today at $435K. Holy cow! She is thanking her lucky stars (and me) that she didn't wait to see if something better came along. It's a jungle out there for you, Buyers, but I can help you understand the market. Allow me to give you the stats and information so you can be the best prepared Buyers out there. Call me soon since real estate economists say prices are going to continue to climb and interest rates will most likely go up as well by the end of the year. And Sellers, I'll explain to you how to be the best listing on the block so you can sit back, relax, and enjoy the ride!